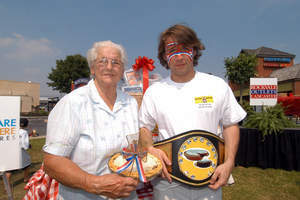 LANCASTER, PA -- (MARKET WIRE) -- June 27, 2005 -- Tim Janus and Dot Martin emerged as victors today in Rockvale Outlets World's Greatest Shoo-Fly Pie Bake-Off & Eating Contest. Janus beat out nine other competitive eaters, inhaling 17 slices or 5.6 pounds of Shoo-Fly Pie in an eight-minute time period. Janus took home a $1,000 cash prize, in addition to the "Heavyweight Title Belt" (as pictured) -- a custom, boxing belt customized with a Shoo-Fly Pie theme. Ms. Martin beat out more than 40 promising bakers to take home the title of "Best Shoo-Fly Pie," in addition to a $750 Extreme Home Bakeover -- a grand prize package of all new, state-of-the-art bake ware. The first annual food contest designed to celebrate the flavor and heritage of Pennsylvania Dutch Country, the event was sanctioned by the International Federation of Competitive Eating, the same federation that produces the infamous Wing Bowl in Philadelphia and Nathan's Hot Dog Eating contests. Rockvale Outlets World's Greatest Shoo-Fly Pie Bake-Off & Eating Contest was held in partnership with sponsors Good Food, Inc. and Dutch Haven, provider of the pie for the eating contest. Shoo-Fly Pie, a Pennsylvania Dutch dessert, is a sponge cake baked in a crust that contains a heavy molasses filling. It must be made with molasses to be a true "Shoo-Fly Pie." Rockvale Outlets is an award-winning, 560,000 square foot outlet shopping center constructed on 64 acres in Lancaster County, Pennsylvania. Among the largest and most successful factory outlet centers in the country, Rockvale Outlets includes a total of eighteen single-level, brick front buildings that offer 120 factory outlets. Hours of operation are Monday through Saturday, 9:30 a.m. - 9:00 p.m. and on Sunday from 10:00 a.m. through 6:00 p.m. For more information, visit www.rockvaleoutletslancaster.com, or call 717-293-9595.